According to the Pokemon GO Team, players can expect "the biggest update to Pokémon GO" to roll out over the coming weeks. The massive update is planned to include an overhaul of the gym battling system in addition to new features like raid battles. 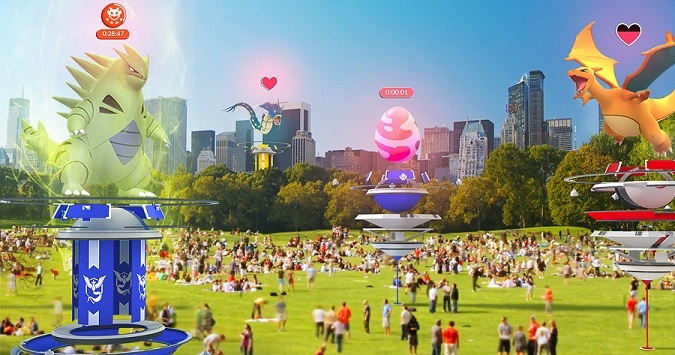 A recent post from the team behind Pokemon GO encourages players to get excited for what they call “the biggest update to Pokemon GO.” Although the initial hype surrounding the game’s launch nearly a year ago has waned, the development team looks to continue improving and refining central game-play mechanics. With this latest update, the team promises to give gym battles a much-needed “face-lift,” in addition to a plethora of new features. Gyms will now also act as PokeStops – rewarding visiting players with items and XP. Gyms can only host 6 Pokemon at a time, with the added restriction that they are all unique. The old system based on Prestige and training has been ditched in favor of a new “motivation meter,” which can be replenished by feeding Pokemon berries. Gym battlers will now be rewarded with Gym Badges – a staple in the main series of games. Raid battles will offer players the opportunity to team-up with up to 20 others for a chance to battle against and capture an “extra powerful” Pokemon. Finally, a host of new items (including the familiar Rare Candies and Technical Machines) will be added. This expansive new update looks to address the complaints of fans who found the game’s battle mechanic to be rather humdrum – almost included as an afterthought to the process of actually searching for and catching wild Pokemon. The team asks players to be patient as Gyms will be temporarily disabled in preparation for the overhauling update. If you have already uninstalled the game or never started, now might be a good time to check back into the world of Pokemon.